There are two libraries at the Department of Mathematics; the research library and the students' library. 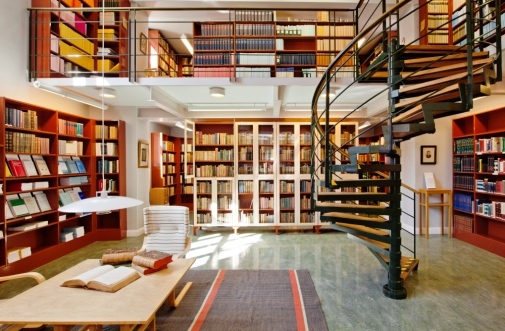 The books in the library can be searched in Stockholm University library catalog. The research library is situated in house 6 and contains a large collection of books and journals aimed at the researcher in mathematics and mathematical statistics. The library is available to the public, but those who do not have an entry card must contact the library first to make an appointment. Monday - Thursday 9:00 a.m. to 11:00 a.m. and 12:00 p.m. to 04:00 p.m.
Closed for lunch 11:00 a.m. to 12:00 p.m. The students’ library is situated in room 21, house 5 and has literature for the students. These books can be useful when you for example are writing a thesis. We have reference copies of course literature, which can be read in the library opening hours. can get help when the library is open. You cannot expect the tutors to provide you with complete solutions to problems or to do complete surveys of parts of the course. The tutors must divide their time evenly between the students who seek advice. Students of mathematics should preferably ask that tutors from the division of mathematics and students of mathematical statistics those from the division of mathematical statistics.